Since Marvel and I won’t be able to celebrate on the actual Valentine’s Day, I wanted to “surprise” him with something special before he left. The limits were diet (we have a lot of food sensitivities at our house), time, budget, and no babysitter. Well, I don’t think anything turns out the way I have it pictured in my mind but considering having to do our school responsibilities, restock our nearly empty fridge, teething baby that’s transition from 2 naps to one, and getting (threatening?) the kids to bed early (can someone tell me why kids NEVER go to bed early when you want them to? 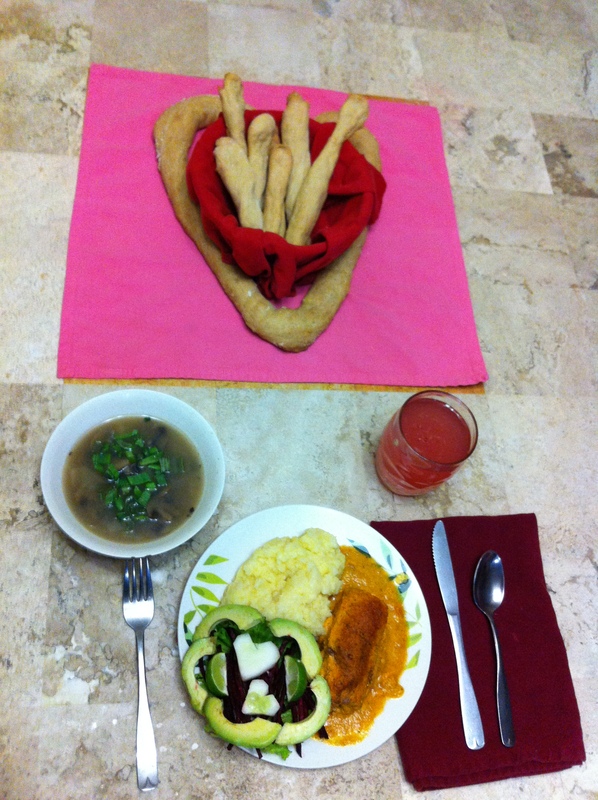 )….it turned out presentable and my hubby was happy so all’s well that ends well. First I made a simple invitation to leave on his computer screen while he was showering in the morning (sorry, didn’t get a picture of that one before it got destroyed). Then we finished up with school and thankfully he took two of the girls to run errands with him, so I just took my son and baby to the grocery store. I cut up the filling for the Beef Milanesa Roll (I made this up that day, you can get the recipe here), being sure I cut up enough to make something similar for the kids on the actual Valentine’s Day. When I got to the mushroom cutting I just chopped them all and made a mushroom soup that could cook while I finished preparing the beef. I rolled up the Milanesas and made the sauce, poured it on and popped in the oven. Then I got the first pan of breadsticks ready, cleaned up a bit and then stuck them in the oven. 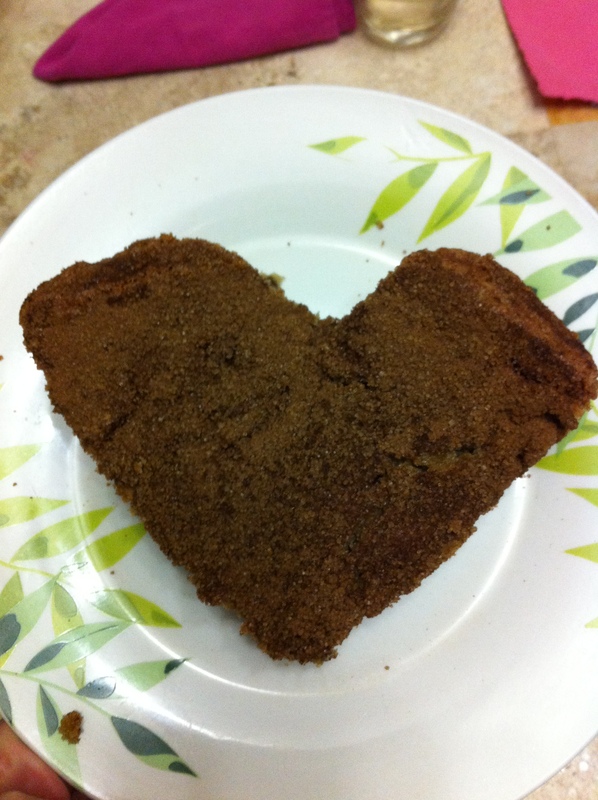 Next I made the layered Maple Spice Cake (get it the recipe here) that is one of the few desserts my Marvel will eat, and put in in the oven as well ( just cut it into a heart BTW). By now the soup was cooked and I turned off the heat for it. I got the potatoes peeled and cooking in the pressure cooker. Then I made the breadstick heart and put them in the oven as I took the first pan of breadsticks out. While I got ready I “set-up” the room with candles and our wedding playlist of music and made everything pretty. After I was presentable I made up the plates and set the table and called Marvel to the table.